In June 2018, I had been looking forward to a nice quiet summer in which I hoped to make some major progress on the articles I would publish for my PhD. This summer, however, was anything but quiet for me or for the Arava Institute. The academic agreement with Ben-Gurion University, our primary academic partner expired in August 2018. Since September, 2017, the Institute’s Academic Advisory Committee has been negotiating with the Rector of the university in an attempt to finalize a new agreement to continue the academic accreditation of the Institute’s courses. The university raised its concerns about the Council for Higher Education’s rules regarding courses taught off the main campus of a university. It took a great deal of negotiations in order to ensure that the agreement concurred with the Council for Higher Education’s regulations. The Rector was finishing his tenure at the end of July, and we wanted to be sure that the new agreement was signed by then. With some last minute negotiations, and our Academic Director Dr. Tareq Abu Hamed pushing it across the finish line, the agreement was signed on the last day of July. The Institute was also able to finalize and sign a School of Record agreement with Bennington College, the Vermont College at which Rabbi Michael Cohen teaches and heads student life. The new agreement, which both Rabbi Michael and Academic Program Director Cathie Granit have been working on all year, will enable us to provide students with a transcript from Bennington College as an alternative to a transcript from Ben-Gurion University. A transcript from an American academic institution may be attractive to Palestinian or Jordanian students, as well as some American students. The agreement with York University on a Master’s track in the Faculty for Environmental Studies was also renewed this summer. The agreement enables a student from the Arava Institute to study at York University’s Faculty of Environmental Studies for one year, and then complete their Master’s in Environmental Studies by doing their research at the Arava Institute. The Jewish National Fund, the University of Arizona, and a consortium of academic and research organizations from the Arava valley, including the Arava Institute, held discussions in Tucson this summer on the establishment of the JNF Global Center for Food, Water and Energy Security. The Center would advance applied research, studies, training, and extension services to meet the needs of vulnerable communities, especially in Africa, by combining the resources of the JNF, the University of Arizona, and the Arava Valley. Those discussions will continue in the fall. In parallel, the Arava Institute has opened up a dialogue with the University of Arizona to develop a joint Master’s Degree in Water, Society and Policy. At the start of the summer, Nolan Zail, an architect and supporter of the Arava Institute from San Francisco, visited the Institute in order to help develop a program for the new campus for 150 students. The purpose of the program is to describe the vision, needs and ways in which the new campus will function. Land has been designated by Kibbutz Ketura for the new campus. 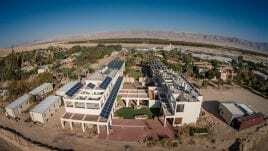 The program will help an architect design the campus which will be the future home of the Arava Institute. A liaison committee between members of Ketura and staff of the Institute was established and met throughout the summer in order to review the current agreements between Ketura and the Institute, and to set conditions which the Institute must fulfill in order to get permission to start building the new campus. The Kibbutz and the Institute expect to finalize those conditions sometime this fall, at which time the Institute will issue a tender for an architect to design the layout of the campus. The Executive Committee of the Friends of the Arava Institute discussed the new campus and how to build a capital campaign to match the needs of the Institute, at its recent meeting in New York. Discussions of the new campus, with its expanded capacity for the Institute, could not come at a more important time, as the Institute has now reached capacity in the current campus. In parallel, a donor has recently raised the possibility of establishing a second campus of the Arava Institute in Jordan. We are excited about this option and will continue updating on its development.